I have talked a lot about the auroras, the phenomenon is due to the magnetosphere of a planet and radiation of our sun that makes energetic charged particles from the sun collide with the magnetic field of a planet, ionizing the atmosphere and giving some colors brilliant (come on, the electrons emit light load and simply). All planets moving core magnetosphere generate all. 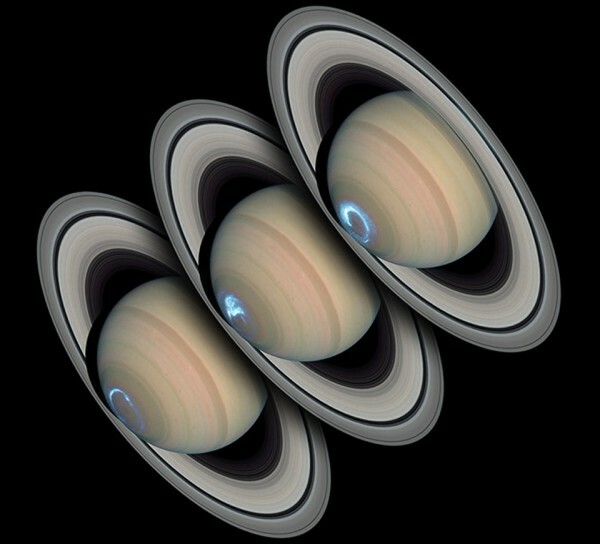 Included Saturn with its rings. While many think that only “solid” planets (in the sense that they are not formed by gas) are those that generate magnetosphere, all planets that have living core do. And if, considered living planets. In the Saturn image, the south pole, taken by Cassini and the Hubble. As this planet has a much larger than Earth’s magnetosphere, auroras last much longer. Days rather than minutes or hours.